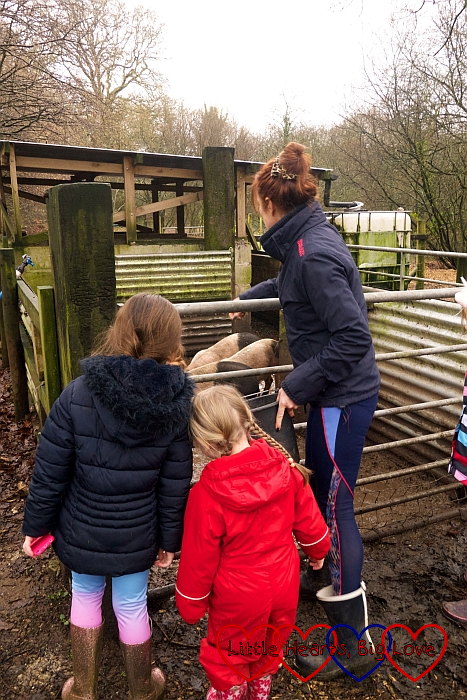 The feed run was one of the highlights of our stay at Coombe Mill over Christmas. It was a wonderful way of getting us outdoors at the start of the day. Each morning at 9am (10am on Christmas Day) we headed for the car park where Farmer Nick and Farmer Fiona were waiting with the tractor and children’s trailer. 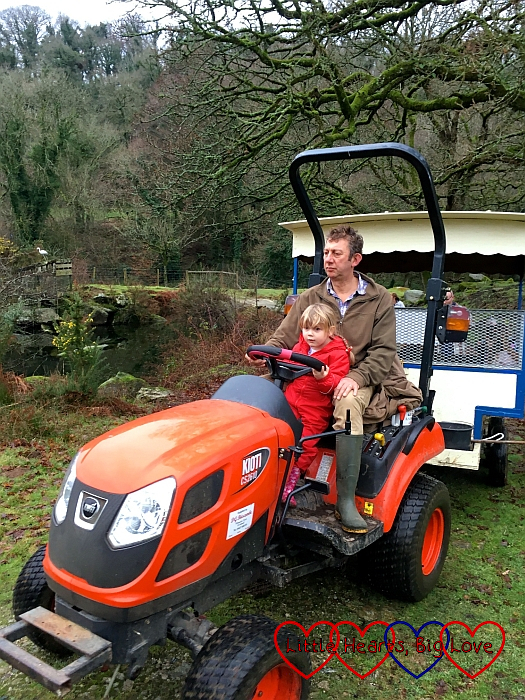 Before we set off around the farm, Farmer Nick chose someone to help him drive the tractor. 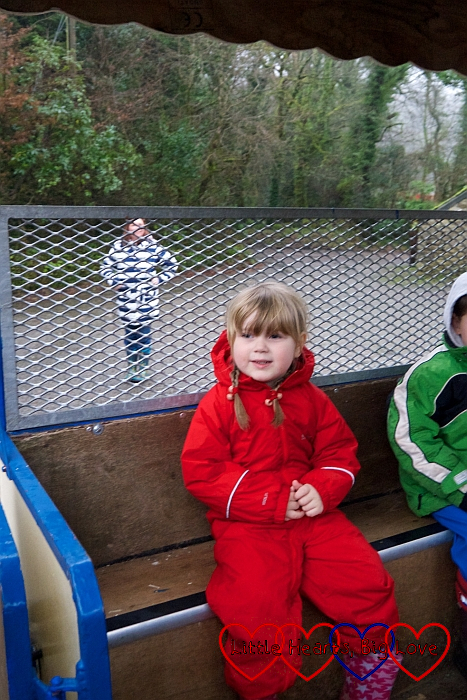 Each time we stopped, the driver changed so there were plenty of opportunities for the children to do so. The adults followed on foot. 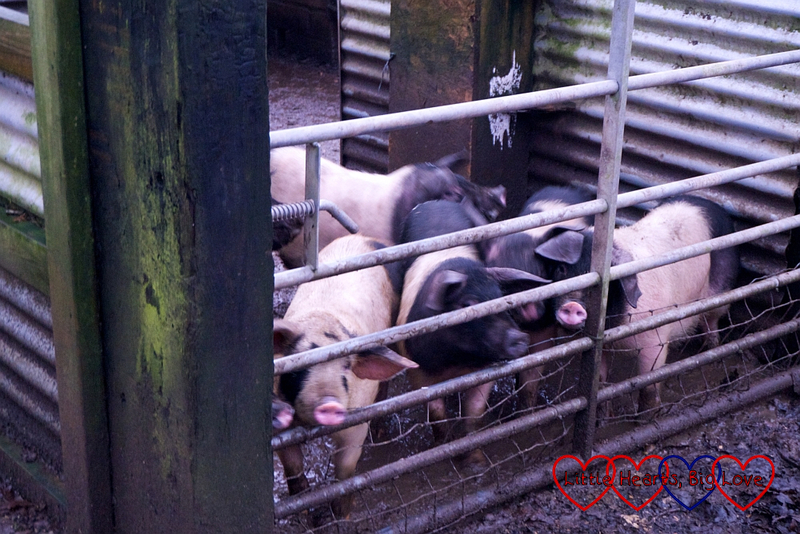 Our first stop each day was the pig pen where the pigs were eagerly waiting for all our vegetable scraps, bread and other non-meat leftovers. They’re not keen on citrus fruits so the Christingle oranges were one of the few things that we avoided putting in a bag ready to take for the feed run, but they certainly seemed to enjoy the rest of our scraps! They were very vocal about it all especially on Christmas Day when they’d had to wait an hour longer for their breakfast! Next stop was the chickens. 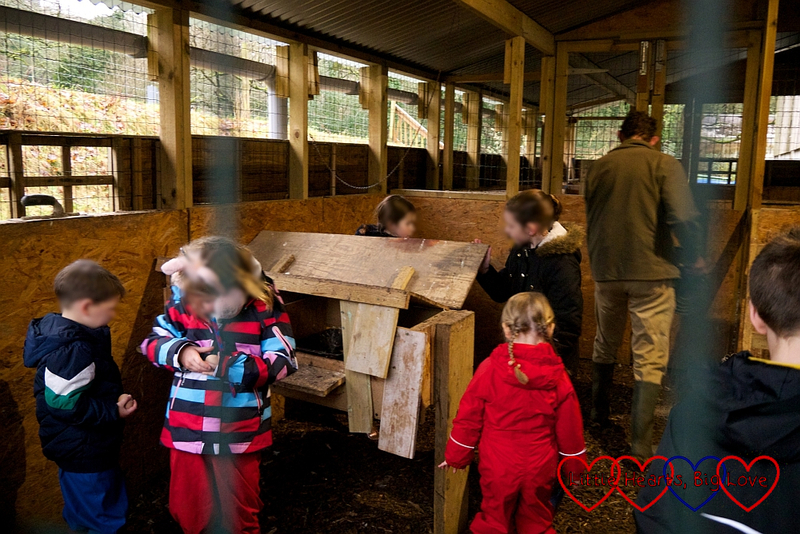 The children helped catch some of them on the first couple of days to bring them indoors to their chicken coop. Sophie wasn’t able to catch one but she had fun trying! 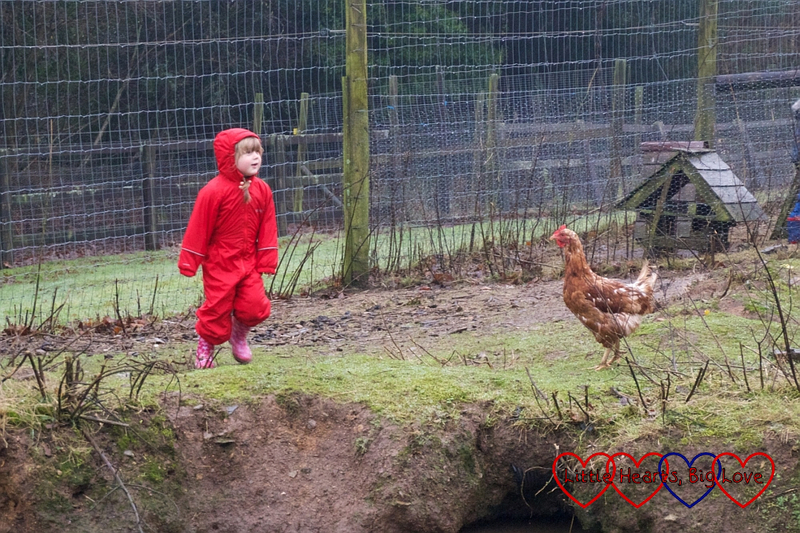 It was lovely to see the three chickens that were named after my children – Jessica, Sophie and Peanut (as Thomas was known before he was born). Sophie quite liked the fact that there was a chicken named after her! 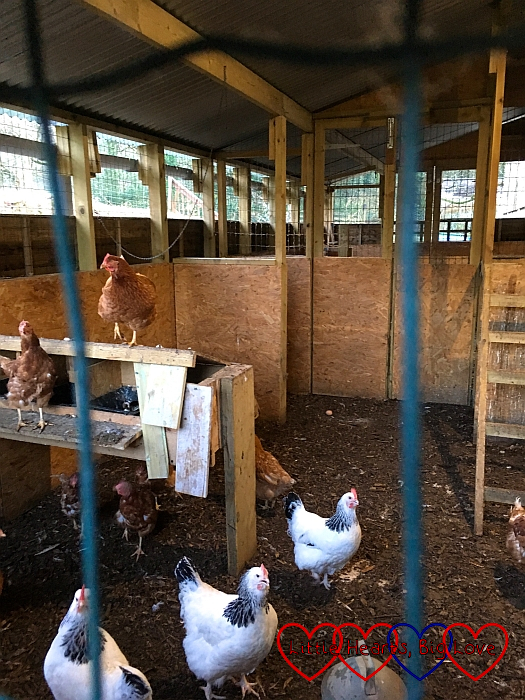 Getting inside the chicken coop to collect the eggs always seemed to be a bit of a mad rush! Sophie wasn’t quick enough to get to the egg laying boxes before all the eggs were found. The older children were good at helping her though and making sure she got an egg a couple of times. 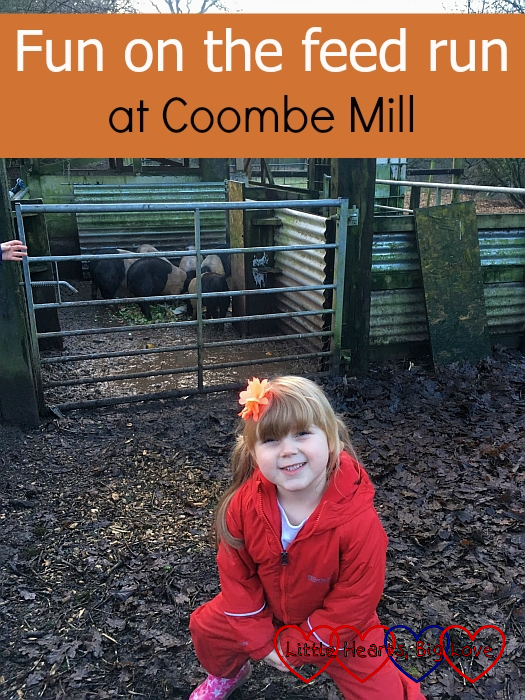 We had tears one morning when the egg slipped out of her hand and cracked but getting to help drive the tractor soon took her mind off it and the pigs enjoyed the egg even if we couldn’t! Sophie enjoyed being able to have some scrambled egg from one of the eggs collected on the feed run too. 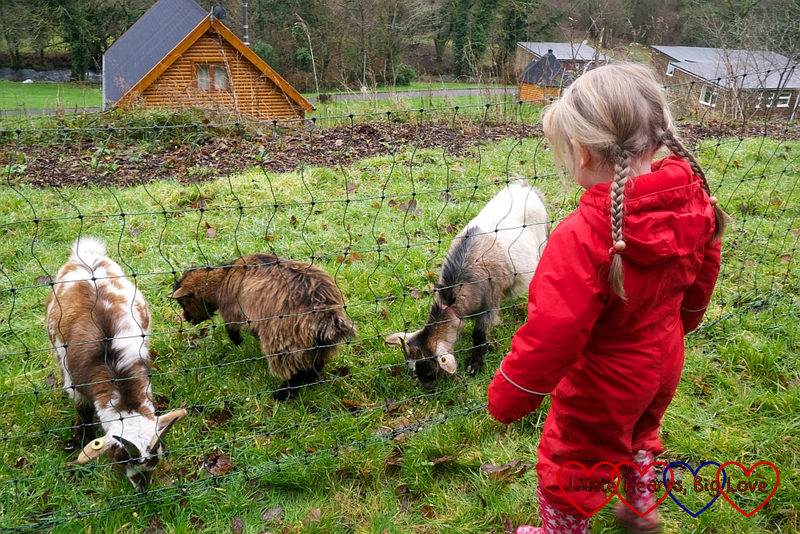 Once the eggs were collected and the chickens fed, we headed around the lake towards the alpaca, goats, deer and ponies. 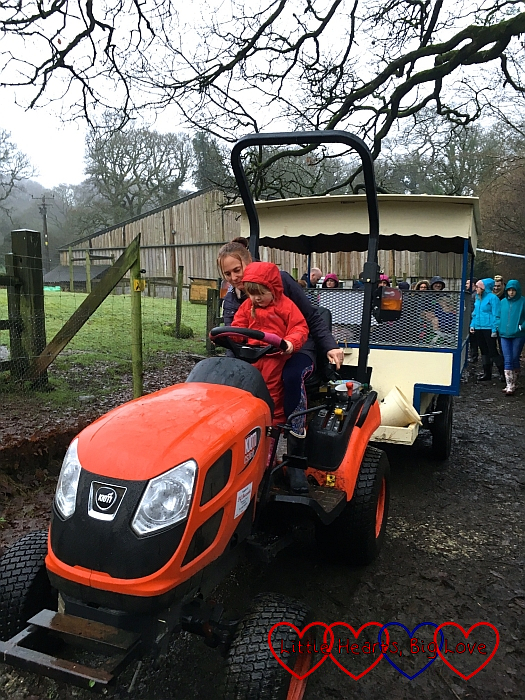 Sophie got to help drive the tractor three times – once with Farmer Fiona and twice with Farmer Nick. Each time it was for the section around the lake. There was a bit of fighting going on between the goats so some of them were moved to separate fields. The alpaca were moved to another field one morning too. The field where the goats were moved to on our first morning was just behind our lodge. I quite liked being able to watch them from the bedroom and playroom windows. 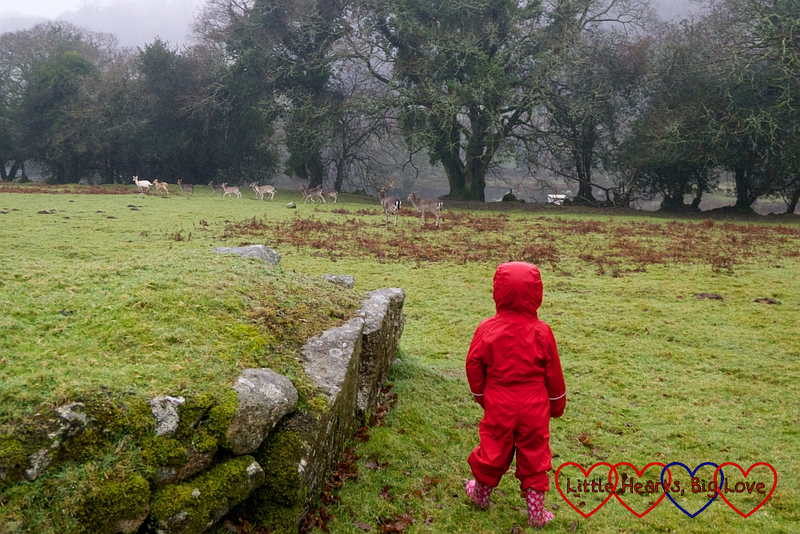 If the ponies hadn’t come down the hill, the children headed up through the deer field to find them. The deer mostly ran away when they saw us coming, although Rudolph kept a close eye on us. I loved how seeing the deer added to the Christmas magic, especially on Christmas Eve. 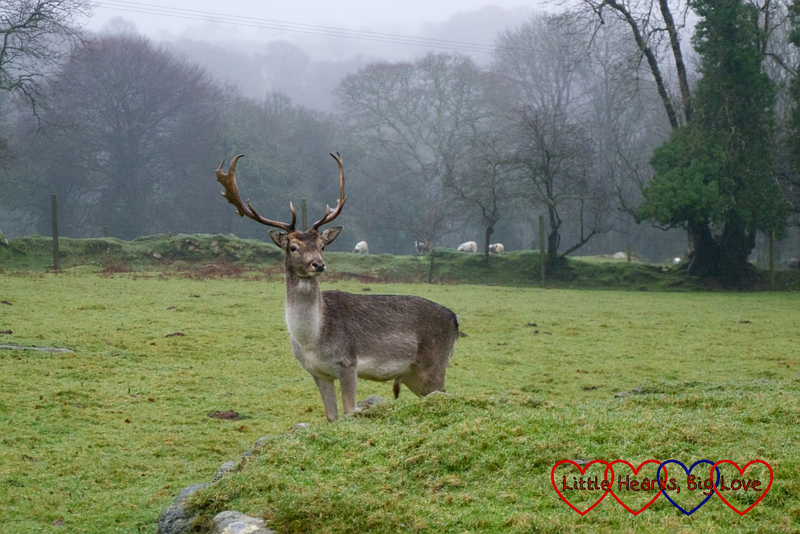 Who knows if Rudolph was needed to help Father Christmas fly his sleigh later that night? Sophie had her magic reindeer food from the previous evening’s activity hour ready to give him just in case! The ponies enjoyed the apple slices that the children fed them. 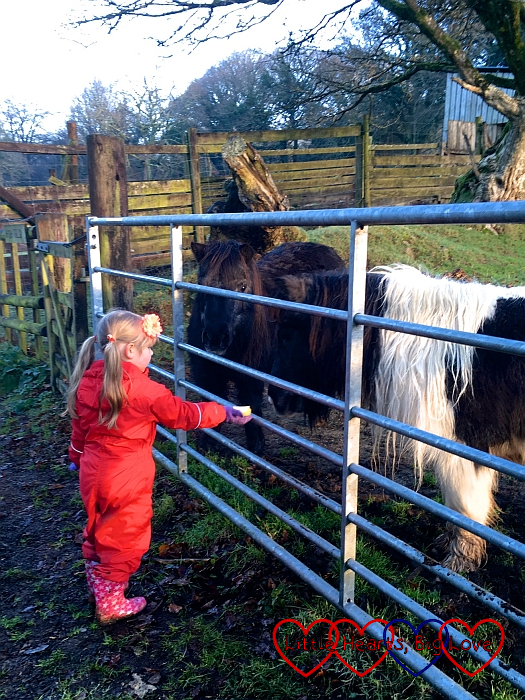 It was lovely to see how Sophie became more confident with feeding them as the week went on. It was also lovely to watch her making friends with the other children. The feed run was also a good opportunity for the adults to chat to each other too. 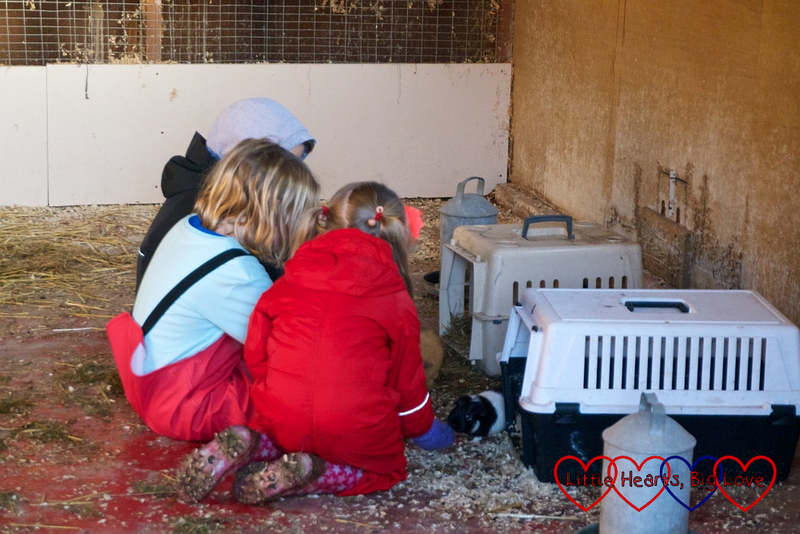 After the feed run was finished, Sophie enjoyed going to see the guinea pigs and their babies. The babies stayed in their box, but she had a cuddle with some of the adult guinea pigs. Getting outside for the feed run really was the perfect way to start the day. 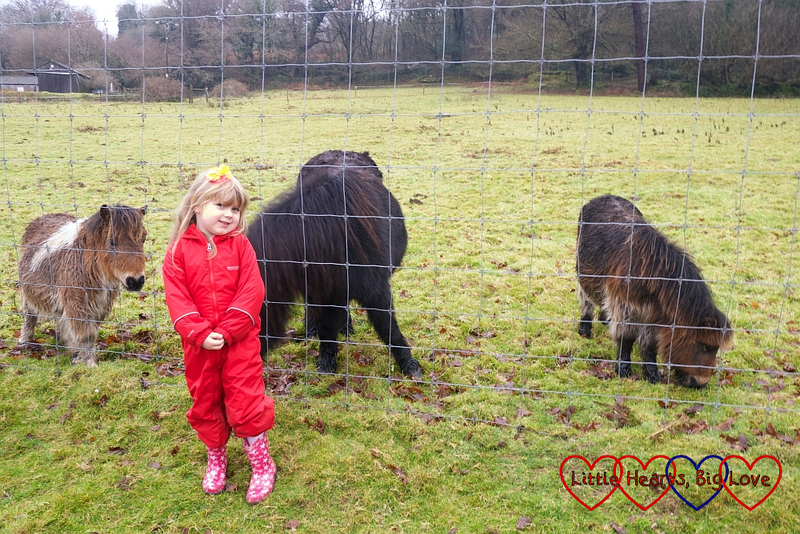 I loved starting the day with a walk around the farm and Sophie loved seeing the animals. It was good for us all to socialise too. I think being with the other children and making friends helped make Jessica’s absence easier to bear for Sophie. The thought of how much Jessica would have loved it was never far from my mind throughout our stay. I could just picture her there with Sophie. While the ache of missing Jessica was always there, seeing Sophie having so much fun each morning made me smile. Happy moments are never unmixed but I am thankful that there are happy moments and that the feed run gave us so many of them. I love that look of concentration when she is driving the tractor. What a wonderful experience to go on the feed run each day. Sophie looks so happy in your photos! 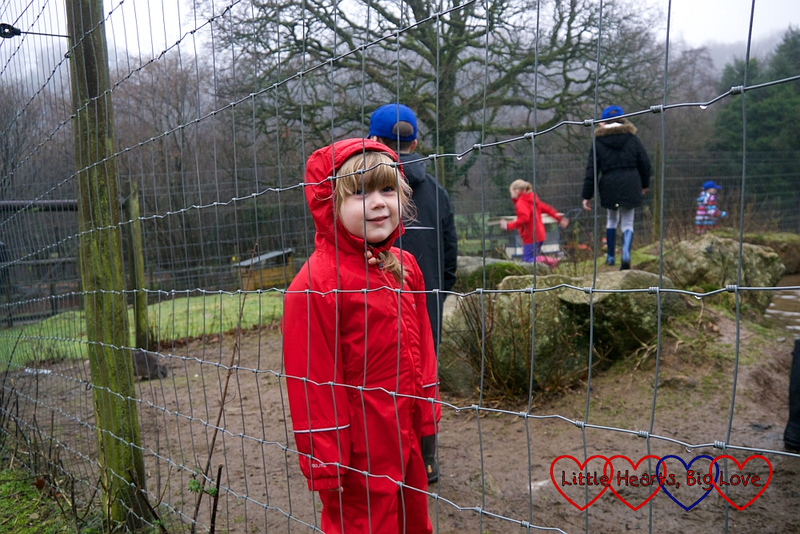 Love her beautiful red snowsuit – very elf-like and spot on for a Christmas holiday!